Meet the man behind this fresh gospel sound. Marcus Johnson is not only a man after God’s heart, but is revolutionizing the way churches are worshiping and praising God. Marcus began singing before he began to talk. Born in Washington, DC, music was a vital part of his childhood and has shaped his eclectic sound today; however, he never pursued a music career during his youth because he never dreamed it could be possible. After graduating in the top three of his high school class, Marcus became a student at South Carolina State University, where he later became a disciple of Christ and surrendered his life to God. His first church family was The Columbia Church of Christ in Columbia, SC. In 1994, God began to place a special dream for worship on Marcus’s heart. With that calling, Marcus decided to train under other singers and musicians to become a worship leader in the church. God made that dream come true in 1995, when he directed his first gospel choir, then known as The Multitude, and began a journey that dramatically transformed worship within the church. Marcus met his lovely wife Michelle, who also shared his love for good music, in 1995. In the same year, he graduated from SCSU with a degree in Industrial Education. The two were married in 1997. In 1998, God had plans to move Marcus and Michelle to Houston, TX. 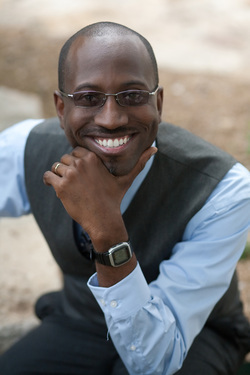 Marcus also laid his unique musical gifts as a foundation for the worship in The Greater Houston Church, which became known as The Forefront, the church’s worship band. Two years later, the Dallas/Ft Worth Church decided that they needed Marcus’s leadership in worship to bring some spark to their Sunday services. Not only was Marcus going on a musical revolution rampage, but he also began to grow in his musical talents by writing his own songs, playing piano, and participating in the musical “Slingshot”. After three years of serving in the Dallas/Ft Worth Church, Marcus returned to The Greater Houston Church where he continues to serve as a worship leader. Within that time, Marcus’s talents were able to shine in the mini musical “...And Believe”, where he played the lead role of Jesus. In 2012, Marcus was given the role of Music Director for Proyecto Alabanza International (PAI), a non-profit organization that is dedicated to promoting excellence in praising God musically within Latin/Hispanic churches worldwide. More information about the organization can be found at www.proyectoalabanza.org. With his continuing perseverance in his faith and musical influences from favorites such as Prince, Stevie Wonder, and Quincy Jones, Marcus continues to evolve in his music and his sound while voices all over praise God with the worship style that he has imprinted in the church. © 2018 Marcus A. Johnson. All rights reserved.